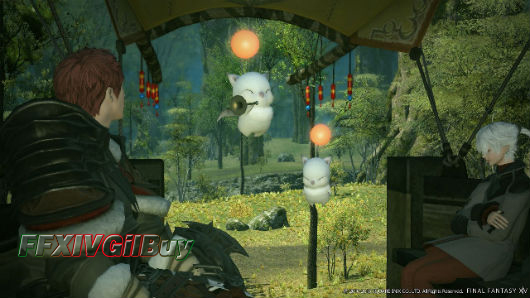 In the previous guide - FFXIV Beginning Guide, I have shared some suggestions about how to earn xp for upgrading. I want to share some experience and tips on way upgrading, each stage of which I will give my suggestions. When adventuring in FFXIV, you will find there are many Aetheryte crystal on the map. Each zone has at least one, you can use them to transport yourself around the world. It is suggested to grab every Chocobo porter in each area. At around level 10-15, you will have chance to change classes. You can choose any class you want to progress with the main story, but any quest you do will be not available again on the new character. In your actions and traits menu, you can select the highlighted classes to gain access to cross-class powers. The Lancer has the ability to use an ability from the Marauder class to leech health while attacking, and heal have ability from the Pugilist class. When reaching level 20, you can join a Grand Company from any of the three main cities. Only a little difference exists among them, mostly having to do PvP. And you can still do every main story quests and side quests from any Company. You can benefit from joining a Grand Company, like embarking upon your mount quest. Go to the Company and talk to your Guildmaster, then head over to any of the three quest givers. Accept some Levequets and grind them until you have 2000 credits with your Company. You can exchange for an item which allow you get access to your first Chocobo. Also, you can get access to riding any of the mounts you have collected through other ways. You can buy FFXIV Gil to buy items that you need to gain access to Chocobo, and it is quite cheap on FFXIVGilBuy.com. At level 30, you can change into your core job, which is an upgraded version of your class. Talk to your class trainer when reaching level 30. Take Lancer as an example, you need to be level 15 Marauder and 30 Lancer to get the Dragoon job. Since you have the bonus XP, it is much easier to upgrade your second class. Normally, it only takes an hour or so to reach level 15. To gain access to your job, you need to complete your original class quest from your trainer and new abilities. From level 30, you can do FATEs to get fast exp bonus, run your corresponding level dungeon, and do every quest from Duty Finder as many as you can to earn xp bonus. Duty Finder is always good way to earn xp when out of Leve allowances, no available FATE or no story quest unlocked.